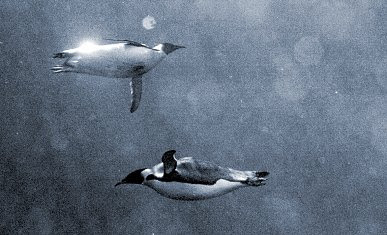 Penguins are birds that swim underwater. Penguins cannot fly. Penguins have black and white feathers. Their heads are sometimes different colors. Penguins are many sizes. Penguins have fat to keep them warm. Young penguins have feathers called "down". Penguins live south of the equator. 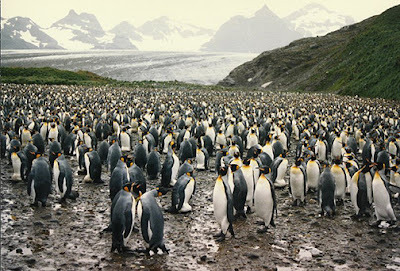 Most penguins live near the Antarctic. They spend most of their time in cold water. 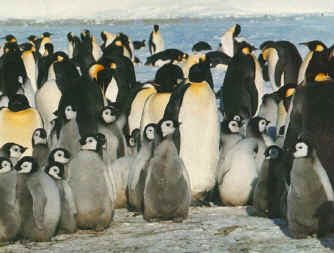 Penguins nest and raise their young in colonies. Penguins eat fish, krill, and squid. They feed their young. 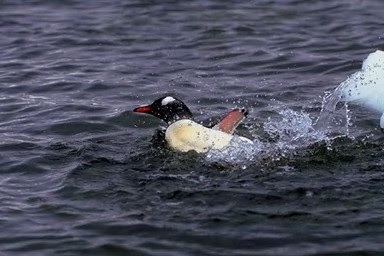 Penguins use their wings as flippers to swim. 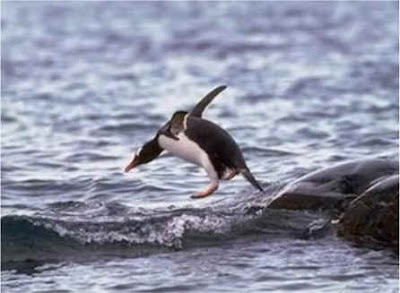 Penguins can leap out of the water as they swim. Penguins have short legs. Penguins waddle when they walk on land. 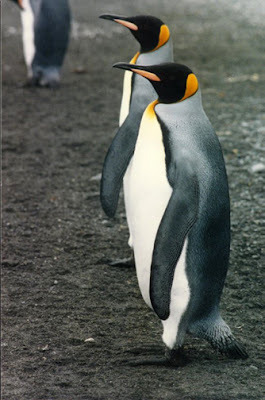 To know more about Penguins Click here. Still more... Then click here. What animal seems dressed for a fancy party? A penguin, of course. The penguin's black-and-white coloring looks like a tuxedo. There are 17 different kinds of penguins. The emperor penguin is the largest. It can weigh up to 90 puunds and grow to be a 4 feet tall. The little blue penguin is the smallest. It weighs 2 pounds and is about 1 foot tall. Penguins have bodies that are built for water. Their short wings serve as flippers. 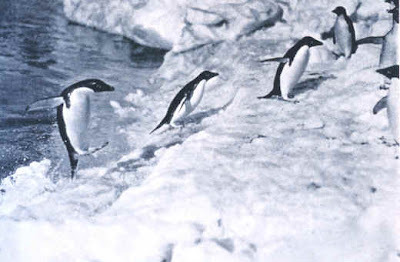 A penguin uses its tail as a rudder to steer. Penguins get their food from the sea. Their favorite foods are krill, which are small shrimplike animals, fish and squid, which they catch and eat underwater. If there is snow, penguins like to get around by tobogganing. They flop on their bellies and slide, using their wings and feet to paddle forward. 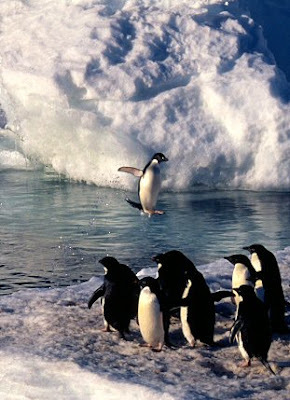 Some penguins can leap from the water several feet into the air! Imagine if you could pop out of a pool like a penguin! Like all other birds, a penguin's feathers wear out. So, each year, the penguin sheds its old feathers and grows new ones. During this time, a penguin cannot go in the cold water because it is no longer waterproof. Therefore, it cannot eat. 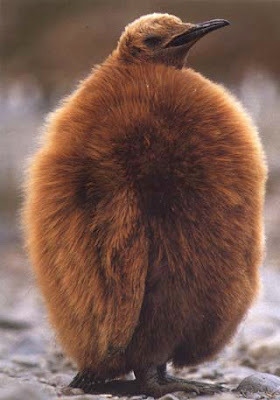 Penguin chicks shed their downy feathers when they are about a year old. The feathers underneath are waterproof. Most penguins build nests to keep their eggs safe. Emperor penguins, however, do not build nests. The egg is kept warm on the tops of the parents' feet. The fathers huddle together to keep the eggs warm while the mothers go to the sea to feed. The mothers return after the chicks have hatched, and the fathers go to the sea. A penguin chick must peck its way out of the eggshell. Both the mother and father penguins will care for the chick. Penguin parents must go to the sea for fish, then come back to feed their hungry chicks. When chicks get older, they gather in groups for warmth and protection. Once a young penguin molts, or sheds its feathers, it grows adult feathers. Then, the penguin is ready to feed and live on its own.